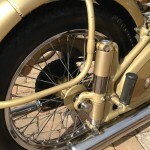 Restored 1953 BSA A10 Gold Flash Motorcycle. 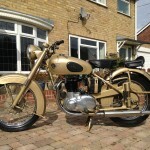 The owner of this BSA completely stripped and repainted this 1953 Gold Flash. The engine was rebuilt with new valves guides and pistons. The camshaft and followers were replaced. The gearbox was rebuilt with new bearings and seals. 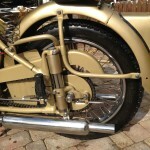 The forks were rebuilt with new stanchions, springs, bearings and seals. New head stock bearings were used. The rear springs were replaced. The dynamo was overhauled with a new armature plus bushes and bearings. The Magneto had the same attention. The brakes were replaced along with all of the cables. 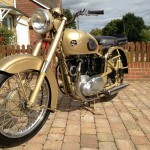 A really nice restored BSA A10 Gold Flash Motorcycle. 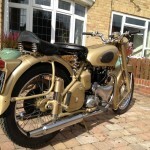 BSA A10 Gold Flash – 1953 For Sale or Wanted? 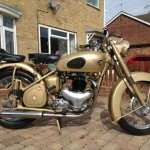 If you're looking for the perfect BSA A10 Gold Flash – 1953 for sale then take a look at the hundreds of restored classic motorcycles listed on our extensive Motorcycles For Sale pages. 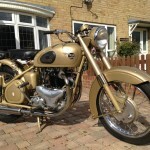 We regularly feature very nice restored BSA A10 Gold Flash – 1953 bikes for sale. 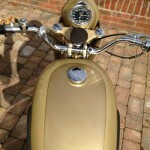 Spares and Parts for your BSA A10 Gold Flash – 1953? 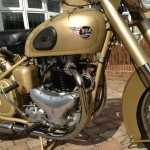 Workshop Manual for your BSA A10 Gold Flash – 1953? 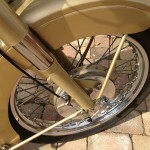 We’re an enthusiast website displaying photos and stories of some wonderful bike restorations.